I don't know about your household, but we go through at least a few boxed food items like cereal each week. Often times the thin cardboard gets tossed in the recycled bin or trash. Lately, I've been saving some of them in my "items to upcycle" stash. Really it is just a box full of odds and ends that's a continually growing pile of recyclables. I also have a large pile of my handmade wool balls in all colors and sizes. 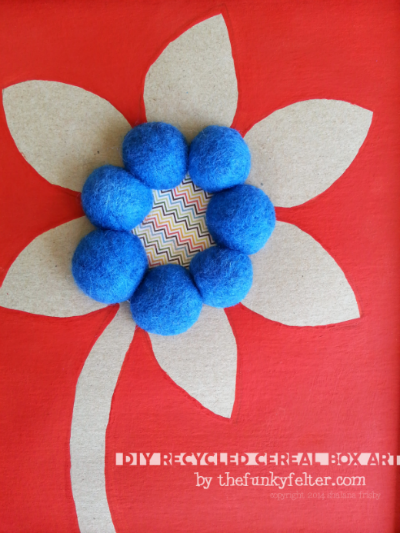 For this easy craft, I decided to combine the two - recycled cereal box and halved wool beads. The instructions are below. When you paint onto thin cardboard, it can warp a little. If this happens, once the paint is completely dry, use a thin towel covering the painted area and a non-steam iron to press it flat. Set your iron to medium heat and slowly work the area on top of the towel, not directly on the paint, to flatten the cardboard. 1. Get the free printable flower pattern. (If sharing, please link directly to this post and not the printable itself. Thanks!) Print the flower shape. Trace it onto the back of a piece of letter size or larger recycled cardboard. 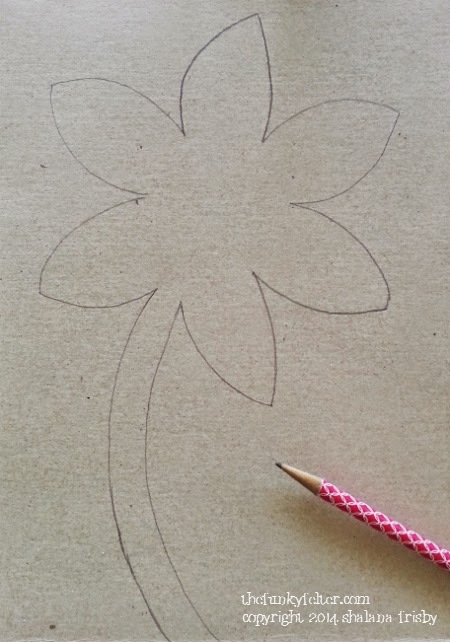 Cut out around the edges to make it an 8-inch x 10-inch rectangle with the flower centered. 2. 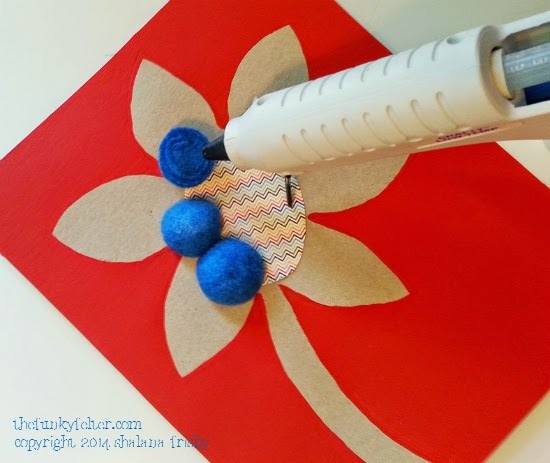 Next use the flat paint brush and your choice of paint color to cover the negative area (outside the flower) of the cardboard. Let dry completely. Then follow my craft tip above to flatten out the cardboard if needed. 3. 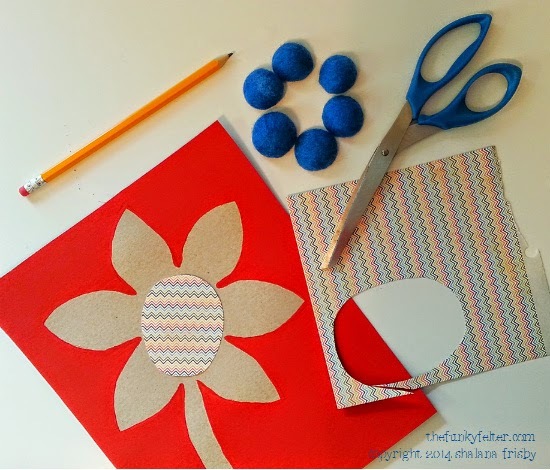 From the patterned card stock, cut a small oval for the center of the flower. I just eye balled the approximate area and size and then trimmed it down as needed. You could also use a large oval or circle punch if you have one. Use hot glue to adhere it to the cardboard. 4. If using wool balls for the embellishment, first cut them in half with a very sharp Xacto knife or straight edge kitchen knife. I saw slowly back and forth while rotating the bead to slice it in half which usually works well. Be careful to watch your finger tips though! Once the balls are halved, place 7 to 8 of them next to each other on the outer edge of the patterned card stock center. Use hot glue to adhere the flat backs to the cardboard. 5. Now place your upcycled flower art into a pretty frame and hang it on your wall. You can see below where mine now hangs in my kitchen above a matching red shelf. I created it specifically for that space to dress it up a bit. 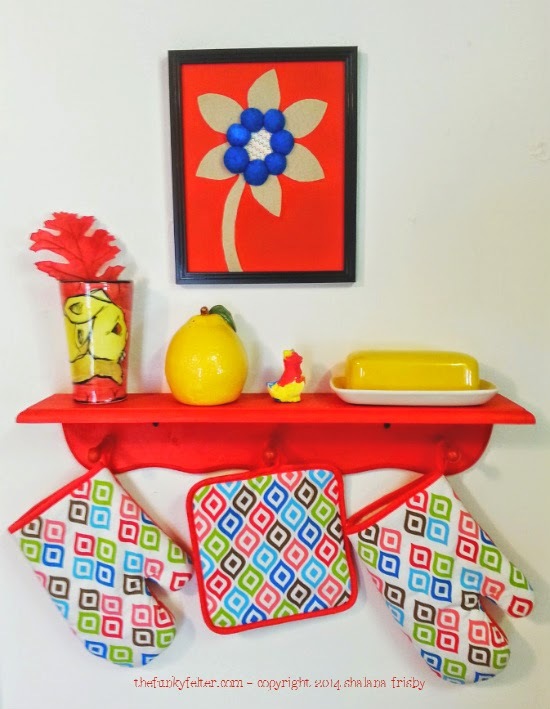 And, yes my kitchen is a crazy bright red, but I love bright colors and wouldn't have it any other way. I am a bit funky after all!